Are you prepared for the one thing that is the most likely event to affect your family? Are you ready for an economic collapse on a grand scale? I’m not Zoltan, the fortune-telling dude in the machine – you know, the one with the turban who waves his mechanical hands dramatically over a crystal ball and tells you of your future in a heavily accented voice. But, I think there is something coming in 2015 that we all need to be concerned about, and I wouldn’t be doing my job, writing these posts, if I didn’t warn you. But there is something very troubling on the horizon, and it’s going to affect us all. From most reports, the outlook for 2015 is not particularly bright. Economically speaking, the bottom is falling out. Sometimes to see the future clearly, we need to look at the past. The most recent economic disaster that the US has suffered was in 2008. In just a few weeks, trillions of dollars of American wealth was simply vaporized in what was classified as “The Great Recession.” Over the next 3 years, American financial well-being was diminished by 40%. Despite what the White House would have you believe, there’s been no significant recovery. And the signs that portended the 2008 crisis are all there, warning us, if we’d only pay attention. Michael Snyder of The Economic Collapse Blog wrote a post with a grim warning last week. Although we’re all being told to spend, spend, spend, because everything is wonderful, the same thing happened in 2007, right before it all hit the fan for many Americans. That’s not all. According to an analysis by Tess Pennington of Ready Nutrition, job security is ephemeral. It certainly doesn’t sound like the outlook for 2015 is the rose petals and sunbeams that Washington is promising. How will the financial collapse affect you? Maybe you aren’t an investor. Maybe you don’t have real estate. Maybe you are absolutely certain, without a shadow of a doubt, that your job is secure. Perhaps you have money in the bank. Nothing. It’s worthless, and that’s the godawful truth. I’m not exaggerating to make a point either. It’s not just overrated, overinflated and backed by nothing but confidence. It is quite literally worthless. Less than worthless in fact! Our fractional reserve banking system spews out “money” that is nothing of the kind. Not only is your money worthless, here a few more ways the current economic trends may still affect you. Unemployment will continue to ripple through the country. Those without jobs now are equal to the number of unemployed during The Great Depression. As the economy plummets, that number will almost certainly exceed the previous highs. Obamacare mandates will continue to impoverish the middle class. The most ill-conceived policy in history, Obamacare has increased monthly payments while decreasing coverage for nearly every person who is gainfully employed. And, if you refuse to procure coverage through Obamacare, expect attempts to penalize you into compliance. This is adding to the unemployment rate as employers struggle to keep their doors open and drop full time staff to avoid having to pay their portion of the O-care payments. How about another refresher on recent history? Remember the economic collapse in Greece? People were digging through garbage to find food. Suicides were rampant as people discovered that they literally could not afford to stay alive. Desperate parents gave up their children to orphanages, just in the hopes that those kids might be able to survive. This isn’t something that happened in the distant past. This occurred in a beautiful, apparently thriving country three short years ago. If you ever prepped for anything that “might” happen, please understand that this current rate of spiral can only end one way: in financial collapse. There is a much greater statistical likelihood of your family suffering from the effects of this than being subject to a nuclear disaster, an EMP strike, or a devastating natural event. I’m not saying that these other things won’t happen, but the odds are much greater that you will be affected by the economy in 2015. For many people the economic collapse has arrived. Their “end of the world” event has already occurred in the form of a job loss, the foreclosure of the family home, or an illness that has caused such massive personal debt that there is truly no way out of it. Less than 60% of Americans who are of age to be in the workforce have a full time job. When you tally that, it means that more than 100 million people are out of work. More than 100 million people in the United States have no jobs. For more than 100 million people, the economic collapse has arrived in full force. Meanwhile, as people all over the globe (think Greece, Italy, Spain, Argentina, the UK) struggle with high rates of unemployment, the prices of everything have gone up. People are struggling to keep such simple necessities as running water and electricity. Grocery costs have skyrocketed – the World Bank released a statement that global food prices increased by 10% in ONE MONTH – July 2012. How can you prep to weather this economic disaster? If you’re here, reading this, it’s probably because you are of a preparedness mindset. You are ready for all sorts of disasters: huge storms, earthquakes, civil unrest, small personal SHTF moments like a hiking trip gone bad. But are you prepared for the one thing that is the most likely event to affect your family? Are you ready for an economic collapse on a grand scale? Prepping for an economic disaster bears some similarity to prepping for other types of disasters. The main difference is figuring out how to make ends meet while making less and spending more. 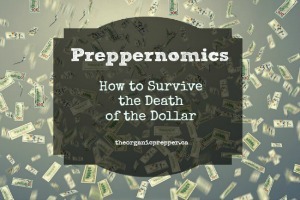 It’s time for a crash course in “Preppernomics”. The answer to weathering the economic collapse is to make some radical changes to your lifestyle. If you are in a position where all is well right now, you are one step ahead. Heed the following and make adjustments to allow yourself to be prepared in the event that your personal finances take a hit. If you are already suffering from the financial downturn, then look at the following suggestions and see what changes you can make. The key to economic survival is requiring less of things that cost money. Some are more important than others, based on your lifestyle and might be considered secondary necessities. You might require transportation, work clothing, a computer and an internet connection, electrical appliances, a cell phone – you are the only person who can define which are these are luxuries and which are secondary necessities. It’s essential to be truly honest with yourself and separate “wants” and “I really enjoy having this” and “the kids will complain without it” from “needs”. You may have to make some brutal cuts. What can you change about your life? Where can you reduce expenditures by several hundred dollars monthly? This is the point at which most people say, “I can’t.” Most people don’t want to move to a smaller house, get an old car, or go without premium cable. But this is where you can truly dig in and create a lifestyle to survive an economic mayhem scenario. Everyone’s situation is different. You may be locked into a mortgage on a huge house in a market that won’t even cover the balance of what you owe. It could be the same with your vehicle. Explore all of your options, though, because paying a few thousand dollars to get out from under it could be worthwhile. Some people could have reached the point where they must begin to default on payments. That, too, is a personal choice. I’m not recommending that you blow off your obligations. (However, do consider the fact that large banks get bailed out by the government, and everyday people do not.) Before making decisions like that, be sure to discover all of the potential ramifications, such as repossessions, garnishing of bank accounts, and ruined credit. Look for free or low-cost entertainment. Consider a family YMCA or community center membership instead of gymnastics clubs or private tennis lessons if you need to enroll your kids in some activities. Go hiking, have picnics, explore parks, go to the library, and find out what’s offered for free in your home town. Learn to enjoy productive hobbies like canning, carving and needlework. Switch from cable to Netflix. Learn to provide for many of your necessities alone. Grow food, join a co-op, raise chickens and rabbits. Even a small salad garden in a kitchen window can help you to offset high food prices. Learn to sew, mend, repair, preserve , and build. Decrease your dependence on consumer goods and services. Embrace your frugal side and opt to be cheap by choice. Prep, prep and then prep some more. The end of the American way of life is upon us. Stock up on beans, bullets and band-aids. If you’re new to the idea of prepping, check out some sites like Ready Nutrition (especially the 52 Weeks to Preparedness Series), Survival Blog, Graywolf Survival, Survival at Home, Survivehive, Prepper Website, Lew Rockwell, and SHTFplan. The clock is ticking, so buy as much as you can, while you can. Despite what many veteran preppers may tell you, it’s NOT too late! Watch for more articles in upcoming weeks about how to position yourself to survive the upcoming collapse. We’ll take a closer look at the points recommended above, with practical solutions you can adapt to your family’s situation. Have you had situations in which you had to dramatically reduce your expenses? Where did you slash your budget? Share your stories in the comments below. You just might inspire someone going through a difficult time.